13/1 NBA Accumulator and Double land on Wednesday Night! After landing a back-to-back winners on the Australian Open, we have now delivered a winner on the NBA! 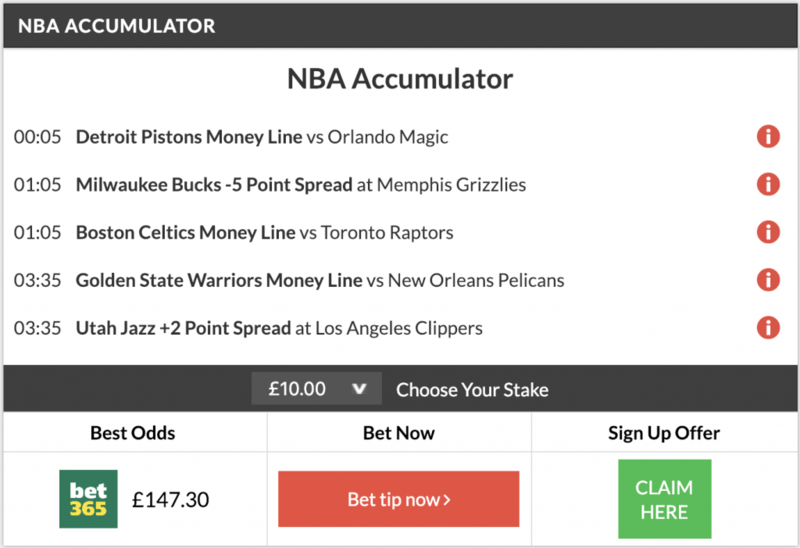 Our Analyst came up with a 5 team accumulator which came in at 13/1 odds last night! The double also came in last night which further increased our profit for the night on the NBA! Great way to start off Thursday!! For our first game on the Accumulator we needed Overtime in the Detroit Pistons vs Orlando Magic game. The game finished 109-109 in regulation, but luckily for us it was the Pistons who found the breakthrough in OT mainly thanks to Blake Griffin who scored 30 points on 11-18 shooting from the field. Every single Pistons player scored in this game. MVP candidate Giannis Antetokounmpo had another stellar game against the Memphis Grizzlies. The Greek Freak recorded 27 pts in 22 minutes on 10/14 shooting to lead the Bucks to an impressive 111-101 victory, which was more than enough for our Bucks -5 Point Spread bet here. In a highly anticipated game between two of the best teams in the Eastern Conference it was the Boston Celtics who got the upper hand on the Toronto Raptors. The C’s got 27 from Irving and 24 from Horford in a 117-108 victory at home. They had to overcome 33 pts from Toronto’s bets player Kawhi Leonard. 287 points were scored between the Warriors and Pelicans last night. Good thing for us was that the Warriors were the ones who came out on top. It was an evenly matched game before Steph Curry caught fire in the 3rd quarter and scored 23 points, hitting four three pointers in the final 2 minutes and 37 seconds. Golden State won by 7 in the end. And finally it was the Utah Jazz in the final game of our Acca against the surprisingly good LA Clippers. It was an easy win for the Jazz as they routed the Clippers 129-109 in the Staples Center. Donovan Mitchell led the way with 28 pts as the Jazz recorded their 25th win on the season, but more importantly they landed our 13/1 Accumulator!! Don’t forget to bookmark our FREE NBA TIPS page so you don’t miss out on any future winners! There’s still five more months of NBA season left and plenty of winners coming our way!